An excuse to eat more of your favorite spud. Do you love fall? Who doesn't, right? This Roasted Veggie and Sausage Pizza is an easy and delicious way to enjoy the wonderful flavors of the season. The taste of fresh, bold flavors makes this pizza irresistible from the very first bite. 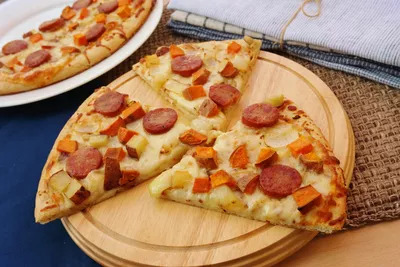 Made with Italian sausage, Provolone, sweet potatoes, red potatoes, and onions, it will keep you from ordering delivery when the craving strikes! Combine sweet potatoes, red potato, and yellow onion in a mixing bowl with a drizzle of olive oil. Coat veggies and pour onto a baking sheet. Bake for 20 minutes or until veggies are lightly browned. Meanwhile, cook sausage in a pan on the stove top until lightly browned on the edges. Brush pizza crust with olive oil and then sprinkle with garlic powder to taste. Then, place Provolone slices on top of the pizza crust. When veggies and sausage are finished cooking, spread them evenly all over crust. Turn oven up to 450 degrees F and cook pizza for 10 minutes.